Katowice, Poland: 5 November 2018. 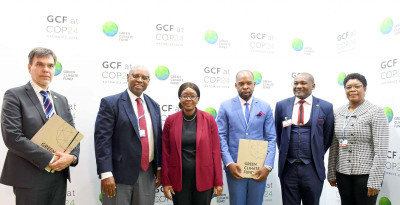 On the margins of the 24th Conference of Parties to the United Nations Framework Convention on Climate Change (COP24) in Katowice, Poland, the Environmental Investment Fund of Namibia (EIF) represented by Chief Executive Officer, Benedict Libanda, signed a Funded Activity Agreement (FAA) with the Green Climate Fund (GCF) worth N$140 million to support climate change adaptation and disaster risk management in Namibia’s Kunene Region. Namibia’s Prime Minister, Saara Kuugongelwa-Amadhila, Minister of Environment and Tourism, Pohamba Shifeta and Deputy Minister in the Ministry of International Relations and Cooperation, Hon. Christine Hoebes witnessed the signing ceremony. In a brief statement, the Prime Minister, signaled Namibia’s strategic intent towards climate change resilience in the country as a means to protect the productive economic and livelihood sectors of the country. She further reiterated Namibia’s commitment to global and regional climate change goals; denoting the signed agreement as testimony of the urgency for climate adaptation in the project’s target area - the Kunene Region. The vast region is one of the driest in Sub-Saharan Africa, where communities face the harshest impacts of climate change. “This five-year project will support resident smallholder farmers in the Kunene region to develop early warning systems and disaster risk mitigation mechanisms to improve resilience of the agricultural sector from frequent droughts and other natural calamities,” she explained. Andreas Biermann, Deputy Director and Mitigation Coordinator at the GCF commended the EIF for successfully accessing funding for its third project from the multilateral climate-financing agency, this time through the Simplified Approval Process (SAP), thereby demonstrating exceptional leadership on the African continent in the design and implementation of climate action projects. He went on to further congratulate the Fund on proving to be one of the best-managed climate change agencies in the world, having proven its effectiveness and efficiency in climate change financing. In a display of commitment towards environmental sustainability and general climate change issues in Namibia, Prime Minister Kuugongelwa-Amadhila pledged the Namibian Government’s continued support towards the Environmental Investment Fund. “Cabinet, in support of the provisions of our Constitution and several associated statutes promoting sustainable development, has resolved to allocate 30% of all environmental taxes collected from potentially polluting products to the Environmental Investment Fund of Namibia, in order to finance climate change projects and programmes. The government will also continue to pursue additional resource allocation to the Fund, as it is a strong catalyst for sustainable development,” she stated at the signing ceremony. The 24th session of the conference of parties started on 2nd December and will end on 14th December 2018.